More Beaver Dams = More Salmonids. Ask a fisherman about beavers and many will tell you they are bad for native cold-water fishes such as trout and salmon. They will claim the dams create obstacles to fish movement, sediment buries fish eggs that need oxygen, and the ponded water is warmed by the sun to the detriment of cold water fishes. These are all reasonable assumptions, so beavers must be bad for trout and salmon, right? WRONG! In most cases streams with beaver dams actually produce larger and more numerous native trout and salmon. Scientific research by Pollock, Wheaton, Kemp, and many others have debunked the assumptions the beavers are detrimental to native fish. It turns out that beaver dams create ponds that serve as ideal nurseries for juvenile fish by creating complex edge habitat, increasing the invertebrate and insect food supply, putting beneficial woody debris in the water, providing slow water refuge reducing fish energy needs, and increasing winter survival of salmonids. These benefits generally greatly outweigh any negative effects such as some gravel substrate accumulating sediment. When one steps back from the outdated negative assumptions cited earlier, it only makes sense that salmonids generally benefit from the geomorphic and hydrologic changes caused by beavers and their dams. After all, these species co-evolved over millennia. Salmonids evolved long ago to take advantage of the many ecosystem opportunities created by widespread beaver damming activities. What about those negative assumptions? It turns out that water temperatures in the lower depths of beaver ponds are quite cool and water returning to the stream downstream is cooled by the hyporheic effect of underground water flow. So the fish actually have both cold water available for refuge, and warmer water rich in food where they can forage. Redds with oxygen-loving fish eggs can often be found on the downstream sides of beaver dams where sediment is scoured away and the water is higher in precious oxygen after water tumbling over the backside of the beaver dam. At low stream levels beaver dams can create temporary obstacles to fish movement but usually this effect is quite limited. Anyone who has seen the powerful leaps of native trout and salmon realizes that adult salmonids can leap over beaver dams on their way to spawn. 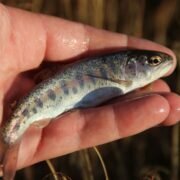 In addition, research by Lokteff and others has also proven that native trout swim over beaver dams in both directions. Some fisherman and their organizations are starting to embrace beavers as a way to improve their fish stocks, but many others still cling to the aforementioned erroneous assumptions. Education can convert these beaver foes into beaver advocates. Our Beaver Institute library currently holds 27 scientific journal articles on this subject and more are being added regularly. Also, the Methow Beaver Project’s fantastic 2.5 minute educational video is well worth watching. If you know fisherman please tell them that the long disparaged beaver is not an enemy to their beloved fish, but rather an important ally and benefactor. Please post any comments or questions here.